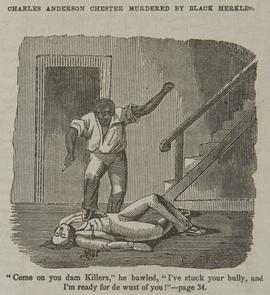 Image of African American man standing above body of Charles Anderson Chester, whom he has just stabbed. Caption: "Come on you dam Killers," he bawled, "I've stuck your buyyly, and I'm ready for de wust of you!" "The life and adventures of Charles Anderson Chester : the notorious leader of the Philadelphia "killers," who was murdered,...on...1849." Philadelphia : Printed for the publishers, 1850.